I love berries. Strawberries, blueberries, and raspberries, yum! My two kids love berries even more than I do and can eat a pint of blueberries in one sitting. It would be great if the price of berries was low all year, but they aren't so during the summer when the prices are low I bake and cook with them as much as I can. Baking has been one of my greatest stress relievers as far back as I can remember and during stressful times in my life I bake a lot. The beginning of the school year is always stressful and I try to calm my sons down as much as possible by baking things that they love. One of their favorite things to eat are biscuits and I bake them frequently. Last week I tried a new recipe for Blueberry Cream Biscuits from the April issue of Better Homes and Gardens magazine, which looked full of berries and delicious. This recipe has 7 ingredients. It takes 20 minutes of prep and 17 minutes of baking time and makes 12 biscuits. All the ingredients are basic and I either already had them in my pantry or I was easily able to find them at my local grocery store. Make sure not to overwork the dough. I did have to add slightly more whipping cream than the recipe suggested in order for the mixture to come together without over touching the dough. I ended up with 12 biscuits total. My biscuits took slightly longer than the suggested time in the recipe. It's always hard to tell with my oven how long recipes will take. The oven was built in the disco-era and it doesn't always heat evenly. I did rotate my pan halfway through the baking time to ensure even baking. I followed the remainder of the recipe as written. These biscuits turned out delicious. 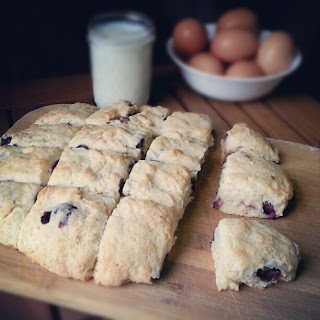 I originally was going to make the blueberry sauce that was included with these biscuits, but my boys ate all the blueberries before I had time to make it. So instead I made the recipe without the sauce. They were delicious hot with butter and I didn't feel that I was missing anything by not including the blueberry sauce. My two boys ate most of these biscuits all by themselves. They are a nice combination of sweet from the blueberries while still having a nice biscuit flavor. I would definitely make these again and they could easily be modified to use other berries or leave out the blueberries completely for a savory side. For the recipe go to Blueberry Cream Biscuits. OK these are actually making me hungry!!! Now I am starving after looking at your blog! haha! New follower here! !